Who loves shopping online? I do, I do!! 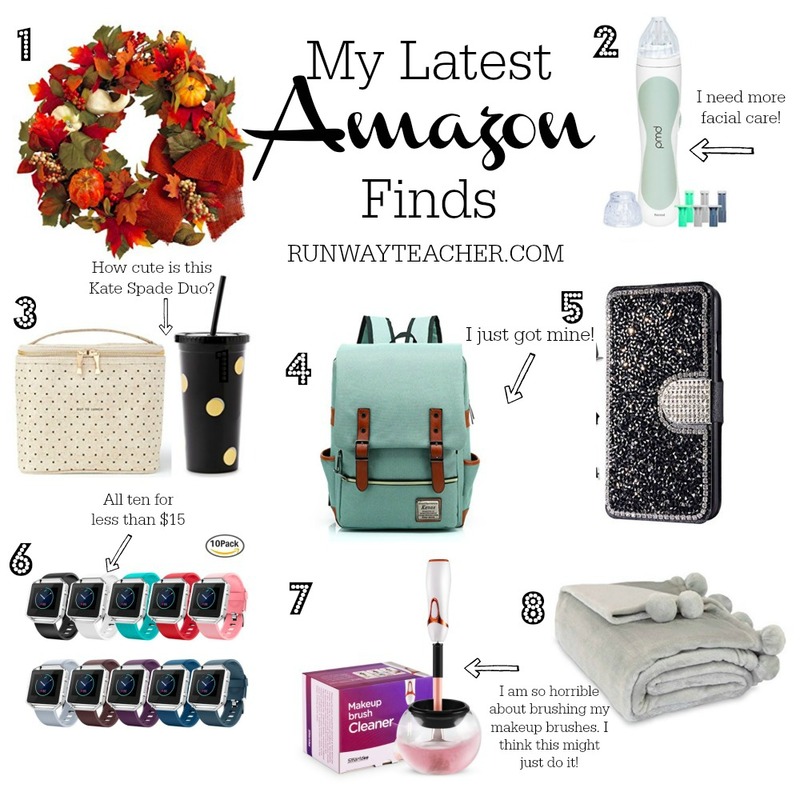 For today’s short post I thought I would fill you in on some of my latest finds on Amazon I have on my shopping cart or already own. We have so many holidays coming up and shopping on Amazon makes it so much easier to shop without having to worry about lines. Amazon comes in handy. Okay here are my latest finds on Amazon. I am currently looking for a one of kind wreath to hang outside my classroom door and home door. I love the colors blended on this wreath! Ever since going in for my first facial EVER, I have been so much caring and aware of my skin. I seriously need to put in time in taking care of it and I have read so many great reviews on this product. It’s time that I upgrade my lunch bag since I’ve had mine for a while now. This duo is too cute, I can’t wait to get mine in! I ordered this backpack a month ago and I use it for work. I have had so many compliments on it and it really helps me out in the morning while I carry my coffee on one hand and my lunch bag on the other. It’s also very spacious so it comes in handy when I have to bring work home sometimes. I haven’t had one of these types of phone cases, but besides the glitter and cuteness of this case I hope it will provide protection. What do you all think? Is it worth the buy? I am forever wearing my fitbit watch, even to sleep. It’s important for me to find bands that are comfortable and I thought this was such a great deal. A pack of ten bands for less than $15? Why not! I am going to be honest you all. I don’t clean my brushes very often and this is not good for my face. I just find it hard and time consuming to wash them out. I am hoping that by buying this it will encourage me to wash my brushes correctly and frequently. I am need of another cozy and cute blanket for the cold weather coming up! I found this blanket and such a great price thus far, so if I can’t find it any cheaper I’ll be snagging it on amazon to snug! I am a participant in the Amazon Services LLC Associates Program, an affiliate advertising program designed to provide a means for us to earn fees by linking to Amazon.com and affiliated sites.Which means I may or may not make some commission when clicking or ordering products. All opinions and images are of my own. Peace I leave with you; my peace I give to you.